Libraries – They’ve Got What You Need! Yesterday I had some free time on my hands and decided to wander into the main branch of the Kitchener Public Library (KPL) in downtown Kitchener. Though I had to navigate my way past a massive amount of construction work – the building is undergoing a substantial renovation and expansion project – it was worth it to spend some time looking at books. I have long considered libraries to be one of the best places to spend my time. I love meandering up and down the aisles, taking for both familiar and new authors/book titles. The architecture of some libraries can be astonishing, as shown by this list of 49 breathtaking libraries from all over the world (see the image, below, of the Trinity College Library for an example). Libraries are also romantic places, full of secrets and potentially long-lost mysteries. 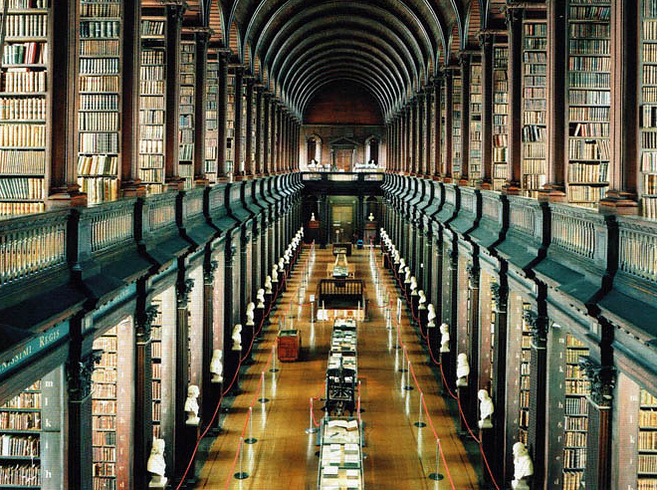 Trinity College Library at University of Dublin — Dublin, Ireland. All photo credits go to BuzzFeed 2013. At one point in my life, I considered the vocation of librarian (or museum curator) as a potential career path. When looking at graduate programs, I was accepted into the Master of Museum Studies program at the University of Toronto and considered doing a Master of Library and Information Science at Western University. What gave me pause was concern that libraries are rapidly changing, no longer the beautiful and architectural wonders where I can wear my hair in a bun and climb tall ladders to pull down dusty tomes on esoteric research topics. Libraries are increasingly becoming a place of technology management to keep current with the changing times. Coalitions such as the I Love Libraries front in the United States argues that, despite these shifts, libraries are still critical community resources that offer a wide array of information types. After visiting the KPL yesterday, I am happy to agree – scanning the shelves, I could have listened to an audiobook, watched a new movie, learned a different language, tried my hand at carpentry through a how-to video – all at no cost to me. I think that libraries remain a place of wonder and mystery, even in this modern era of shifting expectations and rapidly changing methods of communication. Next Post What a Monday! Thanks for visiting my blog. Sorry it took so long to acknowledge your visit. Best of luck in your studies.